This is one among the temples is the complex. 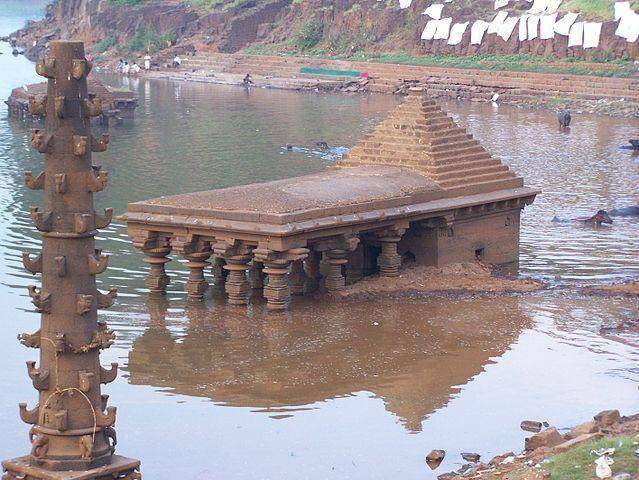 Originally built by the yadava rulers and later enhanced by Emperor Shivaji, this is a holy place with historical significance in Mahabaleshwar. The water from the convergence of panch Ganga (five holy rivers) at one point where it spouts out of a Gaomuk (cow face) shaped opening into the holy pool, is considered to be very sacred and divine as per the Hindu mythology. The five rivers namely Krishna, Venna, Koyna, Savitri and Gayatri make their presence here through five channels that spring closely. The place also receives two divine appearances from the holy river ‘Ganga’ once every twelve years and the legendary river ‘Saraswati’ that is said to give us its darshan(appearance) only on a particular moment called ‘Kapila Shashti yoga’ as per astrology. This moment is revered as very important and propitious as per Hindu faith. Shri Krishnabai temple is another beautiful temple here in a serene setting. The temple filled with intricate carvings, the stone pillars and also the astounding view of the Krishna valley from the temple are a good treat for the eyes.